No one wants to be stuck in the middle of a gridlocked freeway in sub-freezing conditions. We apologize for the frustration and inconvenience that many commuters experienced during the snowstorm Nov. 22. Our goal is to keep the roads clear and traffic moving no matter what the weather throws at us. On Sunday, Nov. 21, our maintenance crews pre-treated every mile of highway in King County and every on- and off-ramp with liquid anti-icer to keep ice and snow from sticking. When snow fell Monday morning, the majority of the roads remained bare and wet because of the anti-icer, and crews continued treating areas of snow and ice with either a sand/salt mix or liquid deicer. By Monday afternoon, snowfall intensified and freezing temperatures turned standing water and slush into ice. We had 23 maintenance trucks on the road in the Seattle area treating more than 250 lane miles of freeway as commuters started filling up I-5 early to beat the impending storm. Our maintenance trucks soon got stuck in the backups and behind disabled vehicles and collisions, and that prevented them from continuing to actively salt and deice some roads. Narrow highway shoulders also prevented our trucks from getting around congested areas to continue treating icy areas, like I-5 in Tukwila. The section of I-5 near Boeing Field and through the Duwamish Curves is elevated, which causes it to freeze more quickly when temperatures drop. There are few on- and off-ramps in this area, so drivers couldn’t exit to city streets to avoid the backups. A serious collision closed all lanes of southbound I-5 at 5:41 p.m. bringing traffic to a standstill. At the same time, the city of Seattle closed SR 99, which funneled more traffic to city streets and I-5. We warned drivers on our electronic signs that southbound I-5 was closed south of the I-90 interchange, and directed them to use I-90 and I-405 to avoid the worst congestion near Boeing Field. The freeway didn’t recover from this and other collisions until past midnight. Here are some photos of freeway conditions that evening. Storms like the one we experienced this week certainly challenge us all in keeping the system working well. We are carefully analyzing our entire storm response, as we always do, and will make whatever adjustments are needed for the next storm. Like many industries, transportation officials use statistics to show current trends or to illustrate the scale of certain issues. For instance, earlier this year the Department of Transportation reported that traffic fatalities fell by 9.7% from 2008 to 2009, reaching the lowest death toll since 1950. The reaction by most people reading that statistic is undoubtedly positive because it shows a downward trend in road fatalities. However, the statistic that needs to be mentioned is that despite the trend, 33,808 people still died on U.S. roads in 2009. This is an outrageous number of deaths and we need to remember that numbers like 33,808 is not just a statistic. These are the family members and friends of Americans from accross the country. This is why I was pleased to read about the DOT’s new video series, Faces of Distracted Driving, on Secretary Ray LaHood’s blog. This campaign helps tell the stories of those who have been personally affected by the issues of distracted driving. Last year, nearly 5,500 deaths and another 500,000 injuries resulted from crashes involving distracted driving. Statistically speaking, 5,500 may sound small, but after hearing the stories of those who’ve been affected, I guarantee these numbers won’t seem like just another statistic. Distracted driving is a dangerous driving behavior and it’s up to all drivers to individually take responsibility for their actions to make our roads safer. We are always looking for ways to improve the travel information we offer on our website to help you make the most informed decision and know before you go. Recently, new technology is available that gives us new ways to display traffic conditions to you. We'd like to show you what we have been working on internally and hope you'll take the time to let us know what you think. On this new "alpha website," we have taken most information from our existing traffic website and put it on what we call a "slippery map." (We are calling it alpha, because we don't think it's ready for a beta just yet.) This "slippery map" is one that you can pan and zoom into, to see everything that could be happening on your route to make a truly informed travel decision before you leave. Let us know what you think of this new website by leaving a comment in the comment area below. We know it isn't quite finished yet, we have a few things that were left out because we want to check with you to make sure this is the direction that we should be going.. Does it give you a better picture of the traffic conditions on roadway? Is it harder/easier to find your route home? How is the navigation speed of the map? Do the layers of information load quickly for you? There are many unknowns with a site like this and our focus while you are browsing is to collect some metrics. We need to make sure this site will handle the amount of spiking web traffic we get when it snows or have inclement weather in the Northwest. We average around 700,000 page views per day in the summer months and that number moves up to 1 million page views per day in the winter months. When it snows in the greater Puget Sound area that number can go as high as 6 million page views per day. We know that there is nothing more frustrating than a website that is not available when you need it and we want to make sure that no matter what direction we go our website can handle the demand. Thanks for taking the time to check this site out and offering your feedback, we appreciate it. Without further ado here is a link to our Alpha Traffic and Travel information website. The next time you head over I-90 Snoqualmie Pass, keep your eyes peeled for critters big or small. Your sightings can help identify where animals are trying to cross I-90. You may be wondering how you get this information to the appropriate people. Well, it’s easy. The Western Transportation Institute and Conservation Northwest recently launched I-90 Wildlife Watch, a citizen-based monitoring program that invites you, the I-90 traveler, to report wildlife sightings along I-90 from North Bend to Easton. There is no animal too small to be counted; Wildlife Watch encourages you to log in all sightings, whether alive or dead. The website asks travelers to identify where they saw the animal. This logging of animal sightings complements other wildlife monitoring work being conducted by us as part of the I-90 Snoqualmie Pass East Project. We plan to use the information logged by travelers and the other monitoring programs to determine which species of wildlife are trying to cross the interstate. This will allow us to determine where to build wildlife crossings as part of the project and to assess the ultimate effectiveness of the structures after they have been built. It was great to see the media coverage from the news release sent Friday (Nov. 5) reminding property owners it’s time to remove temporary political signs visible from state highways. The signs need to be down by Friday, Nov. 12.
must comply with any local regulations. Remember, no signs (other than those used for traffic control) are allowed within the state right-of-way. None – that includes retail, political, garage sale, etc. Why? Both safety and scenic issues. The WSDOT website provides more information about Washington’s outdoor advertising regulations. Utility poles are typically located inside the right-of-way. So no signs on the pole or between the pole and the state highway. Many locations also have a fence line separating the right-of-way from private property. So again, no signs on the fence or between the fence and the state highway. If you have question about Outdoor Advertising, contact Pat O’Leary. 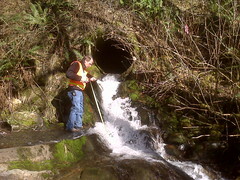 He can be reached at OLearyP@wsdot.wa.gov or by calling 360-705-7296. If your question is about a specific area, be prepared to provide the state route number (I-5, SR 28, US 2, US 97, etc.) and the name of the nearest intersection or approximate milepost. So no signs in the right-of-way - none, ever. And if you do get permission to post them on private property, it's time to take them down for the season. Over the weekend we reached a milestone on our Flickr account; we surpassed 10 million views! It's quite astounding really. Since April 2007, we've uploaded more than 12,000 photos. 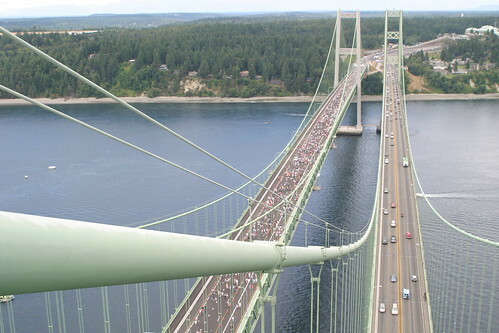 We first started uploading photos in preparation for the Tacoma Narrows Bridge opening celebration. Since then, we have found the account to be tremendously useful in telling our story. The trailer needed to haul this expansion joint across the state was enormous, here is what the joint looks like in place on the bridge. We posted photos from the bridge on the day of this event, and that event started what you see today with the regular posting of photos by our staff. We were very excited to have Darth Vader join us: He probably just wanted to see what successful construction looks like. I am still stunned by the power of the water in this photo. 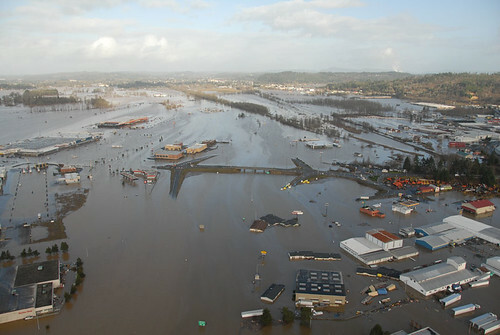 In December of 2007, I-5 in Chehalis was completely submerged for several days. This photo was published nationally and internationally. 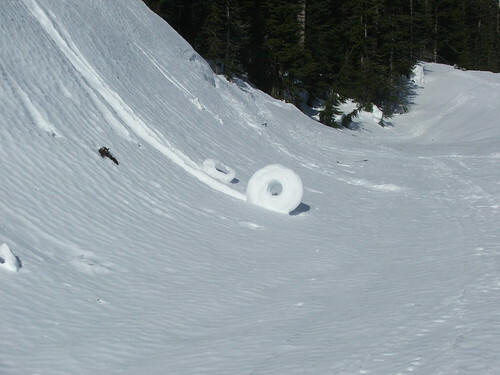 We found it amusing when the photo showed up in The Sun in the United Kingdom comparing their football coach to this snow donut. 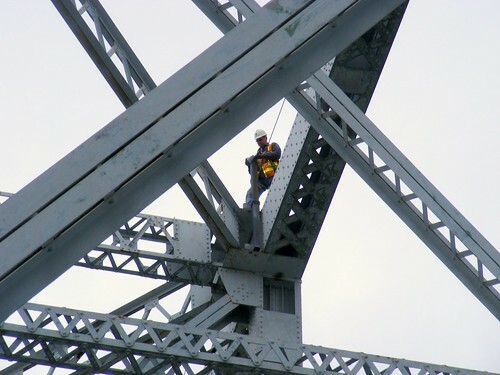 One of our employees was tagging along with a bridge construction crew in July 2008 and happened to snap this photo of the bridge inspector on the Lewis and Clark bridge. There are others that didn't make this list that are worth mentioning, like a photo of a ferry in front of a sunset, the bunny that chased the snowplows, the pika, the bobcat, a large rock in the road, buses dangling over a free way and so many more you'll have to see for yourself. Thanks for helping us reach such an incredible milestone. We appreciate your views, comments and questions. 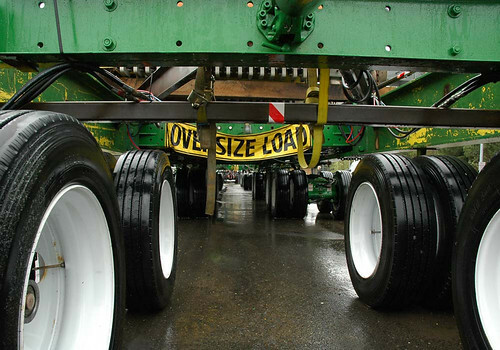 We look forward to sharing more transportation related photos with you. People underestimate the dangers of drowsy driving, but driving while fighting the urge to sleep puts everyone on the road at risk. Sadly, a new analysis of National Highway Traffic Safety Administration crash data estimates drowsy driving is a factor in nearly one in six fatal crashes. As recently covered by the Good Morning America, CNN, USA Today, the New York Times and others, the AAA Foundation recently published a study showing that two out of five drivers surveyed (41 percent) admitted to falling asleep behind the wheel at some point. In fact, just recently in Maryland two highway workers were killed by a drowsy driver in the middle of the day. In recognition of Drowsy Driving Prevention Week®, sponsored by the National Sleep Foundation, the AAA Foundation is calling attention to the serious issue of driving drowsy. Just like drugs and alcohol, sleepiness can impair important functions behind the wheel like response time, awareness and judgment. Many people think they can force themselves to stay awake, but science shows us that isn’t always the case, and dozing off behind the wheel, even for a few seconds, is plenty of time to drive off of the road or over a centerline. It didn’t take long for fish to find their way back to Chain-up Creek once the barriers were removed. For years, a small concrete culvert and steep drop-off made it nearly impossible for fish to return home. 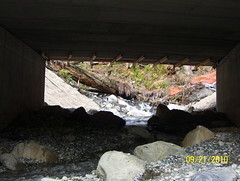 But a brand new bridge along Mount Baker Highway has revived Chain-up Creek and made the journey home to native habitat easier for spawning fish. Fish have already been spotted and photographed swimming in the creek only a month after WSDOT completed work on the new bridge and reopened the creek. During construction, crews were careful to rebuild the creek bed. We strategically placed all the boulders, rocks and logs to mimic and foster the natural flow of a creek. And it’s paying off. We worked all summer to shift a half-mile stretch of Mount Baker Highway away from the Nooksack River and build the new bridge at Chain-up Creek. We recently opened the new bridge, several miles east of Glacier, to traffic. It’s not just the fish who benefit from the new bridge, either. These improvements will make a big difference to drivers and residents in the area. The new bridge and rebuilt creek will reduce the risk of flood damage to the road and reduce the potential for emergency road closures. They should prevent costly emergency repairs and repeated lane closures. It’s a win-win for drivers and the environment.